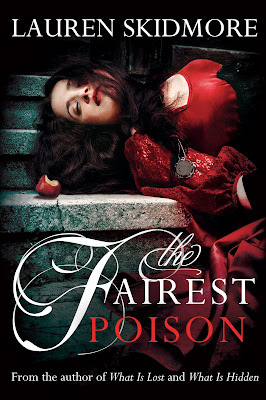 Princess Bianca returns to her court to find it poisoned from the inside out. Faced with mysterious sicknesses, power disputes, and whispers of impending death, Bianca turns to an unlikely allyâa former assassinâto find the antidote that will save her kingdom. But Bianca quickly realizes that she might not even be able to save her own life in this Snow White story. That was the first news I received when I returned to the palace after nearly six months away. I was Venesiaâs princess, and so its ambassador. I was happy to serve . . . but not if it meant coming home to this. âWhatâs wrong?â I asked, shedding my cloak and shaking it out before handing it to a servant. It was still damp with seawater from the journey. It hadnât exactly been a peaceful trip. âWe donât want to worry you, princess,â the other one said, throwing a nervous glance at her companion. Sheâd been with the palace longer and knew I would not be easily dissuaded from getting what I wanted. âOf course, princess.â They both curtseyed. âYouâre dismissed,â I said quickly to my handmaidens. I didnât need spectators for this. They scurried awayâthough Iâm sure to only just around the corner so they could eavesdropâand I turned to face my elder brother. He came barreling down the dimly lit corridor, his half-cloak billowing out behind him. He wore the emerald green mask he favored when he was out of the palace so no one would bother him as the prince. The pure white masks of the royal family tend to stand out in a sea of blues and green. âWhere is he?â he demanded. The head guard and a young woman in a green mask were just a few steps behind him. Looks like we were going to have an audience after all. I was tempted to play dumb but knew that would only make him even more upset. And he had good reason to be upset; I couldnât deny him that. âPlease hear me out,â I began slowly, my voice even and calm. âHe saved my life. I owe him,â I explained simply. âDo you know whatâs wrong with them?â I interrupted, both wanting to know and hoping to change the subject. Iâd bristled slightly at being called his âbaby sisterââthere were only two years between us, after allâbut was willing to overlook it in the name of the greater good of the moment. His accusations werenât untrue; he just didnât know the Chameleon like I did. I might have been part of the reason heâd been captured, but we had a history. And that history meant that I owed him his freedom. I sighed. It was just like them to overlook any health problems until they got too serious to ignore. They didnât want to appear weak in front of the kingdom, and to appear human was to appear weak. In the kingâs eyes, at least. âIâll go see them first thing in the morning. We all need our rest.â I gave Aiden a meaningful look. âThat means you as well.â I was sure his mask hid dark circles under his eyes, one benefit of our countryâs tradition. I knew my brother, and heâd been pushing himself too hard. Iâd gotten snippets of the unrest that had crept into our court from his letters while I was away, but it was another matter to see him in person. From what I understood, the court was reluctant to accept him as their next ruler. He had no respect for tradition, they claimed. For generations, the royal family protected themselves behind pure white masks, fine clothes, and strict rules. Aiden wanted to make changes that gave him more personal freedom as well as control over the country. âFine,â he begrudged as he turned, offering his arm to the woman beside him, who looked as tired as I felt, plus awkward after witnessing a royal argument. Evie, he said her name was. Heâd written about her. He had proposed marriage to her, and sheâd said no. I was very curious about her. âI am glad youâre home, though. I missed you,â he said. I smiled. âI missed you too.â My gaze shifted to Evie, and I opened my mouth to greet her properly. She rolled her eyes at him but offered me a shy smile. âIf you insist,â I replied with a smile for her and a raised eyebrow for him. Its effect was somewhat lessened thanks to my mask, but he knew my expressions well enough to spot it. He chuckled and shook his head with affection in his eyes. âUntil tomorrow,â he said, and we parted ways. The halls were dim and quiet, but I could have found my way to my chambers in the dark. I rarely left the palace growing up, and walking through these halls now felt like slipping into a warm bath. I loved the palace. Servants had already brought my trunk to my parlor. Normally, I would need help dressing for bed, thanks to the complex finery of the clothing that comes with royalty, but since I was still dressed in a simple traveling dress, I didnât bother ringing for a handmaiden. Iâd missed my rooms. It had been a long time since Iâd been alone, and my rooms were the one place I was granted my privacy. For six months, Iâd been acting as ambassador to Nishima, a neighboring country we had strong ties with. That meant that for nearly six months, Iâd been constantly surrounded by peopleâif not by the dignitaries I was there to see, then by my own guards who never left my side. Even on the journey home, when weâd been sidetracked by the hunt for the Chameleon, Iâd never been left on my own. But in my own palace, in my own rooms, I was alone. And I felt safe. I fell asleep almost as soon as my head touched my pillow. The next morning, Iâd barely dressed before I heard insistent knocks at the doors to my suite. I knew it was Aiden even before my handmaiden opened the door to reveal him. He opened and closed his mouth several times, searching for the right words. Lauren Skidmore grew up in Kansas, with stints in Ohio and New York, and currently lives in Utah. She attended Brigham Young University where she earned a BA in English Teaching with an emphasis in Teaching English as a Second Language and Japanese. She then spent a year in Japan teaching and travelling. She hasnât made it to Europe yet, but itâs on the list and has been to 30 states in the U.S. so far. When sheâs not exploring new places, you can probably find her on the internet with fifteen windows open and looking at just one more thing before actually getting something done.